Totally with you on flash. I need to get with you on user modes. Have you seen any greg heisler stuff? As I understand, the V1 has been developed yet, and Godox will start to sell it in two months or so. Robert Hall gives all the available info on his video. The AD200 have two screw holes on the body, and one on the head, but no hotshoe. It has a 3.5mm sync port so you could use a V6II receiver (with a proper cable) to trigger the AD200 in a basic way, without remote power control. That is, you could have the XproP on your pocket and change the power this way. Also, with specific Cactus V6II firmware, you could HSS sync with your AD200 this way, by enabling HSS manually on the AD200. But I think that stacking the XProP on top of the cactus V6II master is a better option, so you could also control the AD200's power. 1. By setting AUTO flash on the V6II, you can use the AD200 in manual mode. No HSS. You can 'extend the sync' up to 1/320 or so if you set POWER SYNC delay to 27, but that's all. PTTL was working during a moment but then stopped working again... really inconsistent. The preflash is fired but the main flash is fired at 1/128 always. The most funny is that it HSS works this way with my XProC (Canon version). I think the canon profiles on the V6II make a better match with the Canon XPro, compared with Pentax ones. Of course that PTTL doesn't work, I'm using a HSS only firmware :S !! With the Pentax 'A' version firmware, the behaviour is even worse: the XproP is not fired at all, also if you put TTL pass, AD200 is fired but at full power always. I do have two V6ii's, in theory I could leave one as Pentax Firmware for best control over RF60x's and set another one to being Multibrand in an effort to bring the AD200 into the equation. Honestly I can't see a good solution for you, no Godox speedlight have a screw hole, so you should look for another solution if a hotshoe is not fair for you. The only option I can see, in Godox world, to have a PTTL flash on camera that you could put on a lightstand easily, with screw holes, is the AD200 with the EC200 extension cable. This cable allows to detach the AD200 head from the AD200 body, then you can hold the body on your belt, put on a bag, on a big pocket... and the head can be screwed to your camera, on a bracket. The XProP, on camera, can control the AD200. The guy of the pic have the X1T trigger, but there is no Pentax version (although Godox is developing the Mk II version of this trigger). Change the X1T for the XProP, and attach the head to a bracket, and it's done. I used the bulb head with the standard bowl and a diffuser, so I add a bit of softness, and don't need any extra diffuser. I think it can be a valid 'run and gun' device . I have a similar bracket which is great for centering the light though. LOL my next suggestion was duct tape and a lacrosse stick. Ok, wait up... there's maybe some confusion as to my intention with mixing Godox and Cactus so I'll first address that (no doubt my fault as I am terrible at explaining stuff). 1) For 'running & gunning' I feel pretty sorted with the cactus lacrosse + Umbrella combo (and have some more pics to show this below). If I replace this set up with a Godox V1 or V680II triggered from an Xpro-P then that could be fine too, depends how easily and sturdy I can make that design work as I feel I will be relying on the footplate screw hole/hotshoe as a means of rigging that up. 2) The other aspect of 'running & gunning' is that 'single light in the field' set up, here's where the AD200 would be helpful (like how you have illustrated), or... can I make do with two speedlights? (see more details below). I don't think of this so much as running & gunning but rather ultra small portable studio set up, which means at least a light stand and quick set up/take down times, on location shoots etc. AD200 is attractive due to the power output for this scenario... but then if adding an AD200+XproP to the collection my mind then starts to think about what other applications can I bring the AD200 into? Can I successfully trigger and control it's power output via a V6ii somehow if using a multi light studio set up (with my current equipment, ie cactus stuff)? Something where I don't want or need P-TTL or HSS, but can get 1-2 RF60x's firing and one AD200 (as the key light) etc? If this was feasible, even via running a cable around the joint that might be what I could settle with, vs selling RF60x units, buying new Godox ones and losing possibly a nice 'running and gunning' rig as well as funds in the transfer and acquisition of new stuff. Truth is I have never used a strobe before, so I am intrigued as to how much better the quality of light can be, especially from a studio perspective. The Godox V1 will likely replace my AF360FGZII at some point tho, I'm more interested in that than anything else tbh, especially if it can manage the trick that the little TT350P can (which is to fire HSS in full Manual power control...). I would use the V1 in the hotshoe of my camera and through the roundflash softbox, which I think is a neat little thing. So it might be I always run and gun with a V6ii and RF60x, sell the other RF60x (and v6ii, and AF360FGZII), use a AD200 + V1 + XproP for studio stuff and on location shoots... I'm not sure I really need more than 2 lights firing in a studio set up, and I think we can trigger the RF60x optically from that set up anyway? But I am interested in my interim solutions, those points between buying the AD200 and not fully switching across. Pics of that set up by chance? Ok... so I'm steering this thread slightly back onto it's initial point which was running and gunning softbox options. Tonight I had some time to use my handy assistant Davo once again to help with some low light evening HSS work in my garden testing a variety of options in a semi decent controlled manner. My initial aim here was to have my camera and flash tripodded/lightstand to mimic someone whom might be 'running and gunning', with the extremely patient and cooperative subject staying in the same spot under the same lighting conditions we could see the difference in light fall off and quality output. It's kinda hard to see from the pic (I took a bad angle shot in a hurry as I was trying to work fast and not lose too much light/get drastically different lighting conditions throughout the tests..) but the camera is just behind the flash. We're to imagine here I am holding the camera and holding the flash lacrosse style (Stage 1 image pictured in previous post above). Camera and flash are a little over a metre from the subject. I am using the K-1 with FA43. I am shooting into the sun, the sunlight (at this time) is hitting the back of Davo's head, a classic 'sun lit rim hair' shot (that when exposed nicely for the hair the subject would typically be underexposed silhouette without the help of flash). The FA Ltd's are not known for controlling flare so you will see some flare in these shots, but it's intentional (in a portrait I quite like a little flare). All shots shot RAW and then used the Convert to Jpg in camera and then directly uploaded to flickr, absolutely zero retouching. (here we can see the camera better now, and before anyone asks I did position myself at the camera and have my hand out to the side to see if I could touch or easily hold the flash and indeed I could, so these shots really do represent what could be done 'on the go' handheld). Wow! Ok... things are looking much better. It looks like we've lost a little light but the overall quality of light is much better, zooming into the face and we can see the shadow fall off from the nose is much softer, a definite improvement. It looks like the umbrella works wonders and is definitely worth adding to the rig. It was only after these shots were taken and I was back at the computer that I had the idea to try out magmods own diffuser filter gel thingy and try to use that instead of the umbrella (for ease and less chance of poking someone's eye out!). If you're not aware Magmod have a little magnetic 'filter holder' thing that can hold gels and stuff, one of them is a diffuser, so perhaps putting this on first, then the magbounce and we might get something similar to the above but in a more streamlined safer package, will have to test and get back to you all on that. Here we now have the flash and camera about 2.8-3m back from the subject, I am starting to lose a little light now, but still I am getting shutter speeds in the HSS zone so I soldier on. Please note that this shot shows the softbox in full swing with a diffuser and grid, but I did not start off that way, only through the session did I start adding those elements in. Cool! 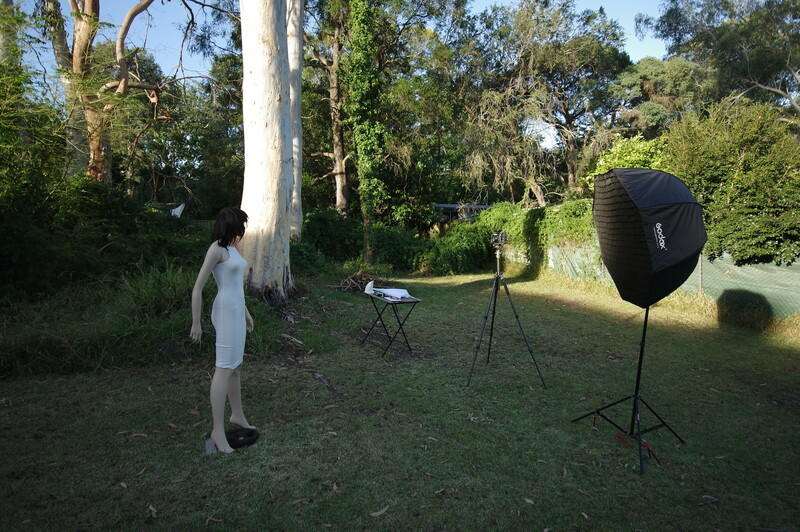 We got quite a bit of light, plenty to work with here and we're still 3m back with the softbox. Still... if we zoom in we can see some harshness of the light, that straight edged nose shadow is starting to come back in. But... do we care? I mean... shooting further back like this is more about the context of the scene more than light fall off properties (at least that's kinda my take on it). 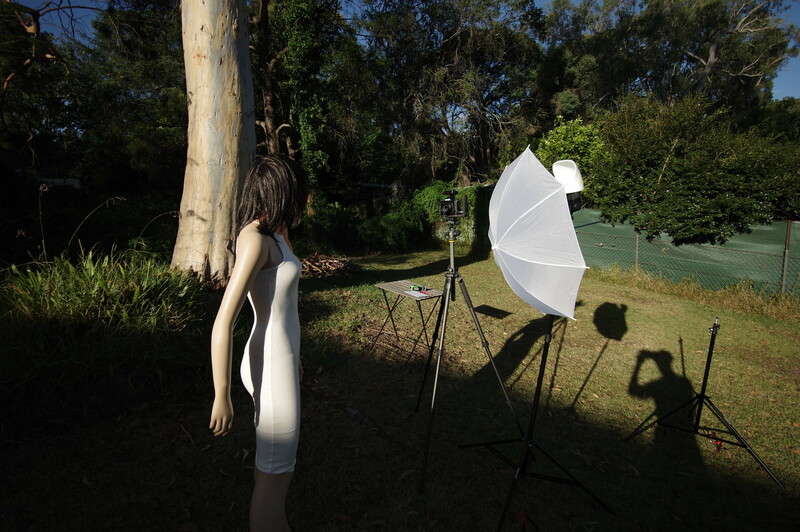 Next up we do the same again and add a diffuser panel to the soft box, see what happens? why not! Things to note, we're still in Av Mode, still -0.7 EV but we've dropped some shutter speed. Thing are still (ambiently) exposed the same but the addition of the diffuser panel has robbed us of some brightness on the subject. However, we can see the quality of light is better, the nose shadow much improved. So lastly, just to see we add the grid and for giggles move the lightstand+Octabox a lot closer, I want to see how well we can light Davo up! Alright! Davo's looking great! We have an abundance of light to work with here and the shadow fall off is really acceptable. Of course in this frame we can see the softbox, so I would need to switch lens to something like a FA77, or reposition myself or tripod up, take the shot, then move the softbox and take a second shot without it in frame to assist with masking it out in post. I somehow knocked the aperture up to F2 and we lost some more light and shutter speed but it's all good! So... there you go. I hope someone finds this interesting, I know I did. I shall attempt some more shots tomorrow. I would like to see how the lacrosse stick + diffuser gel (instead of umbrella) handles and also I might try playing around with the Octa box again but this time see if I can get an idea of the spill of light (maximise coverage area and not so 'spotlight like'), see if changing where I aim the speedlights inside the octabox really matters or not (from being pointed at the centre or slightly off etc) and also changes in zoom settings (16mm-200mm). I have also not used but perhaps can factor in the third speedlight AF360FGZII for some additional power.. I would also like to try in harsher conditions, perhaps midday, see if we can get some extreme HSS situations going and see how we go. It's a coldshoe with a screw hole at the bottom, can't be used to trigger the AD200. A V6II could only connect to the AD200 body (not the head) using a sync cable for triggering. V6II TX or RX mode worked for me (RX mode tested on a V6). To control power in such configuration, you have to access AD200's power dial; not so comfortable, depending on how you hold the AD200's body, but could be done. So I think you could put the AD200's head on the V6II's hotshoe and trigger the AD200, but the real triggering were done by using the sync cable V6II -> AD200 body's sync port. Last edited by morenjavi; 03-12-2019 at 05:20 AM. Appreciate the write up. I wonder if you have two lacrosse baskets. A 2 headed stick might work as well as the diffusion with safer portability. More of a light strip than a dish. (Might look more like a battle axe) The octa setup looks best in this preplanned shot of course but how many unplanned shots will you miss? A little furthur in your process you might want to try a multi shot comparison. Maybe the octa gets you 3 quality looks and the lacrosse gets you those same looks 80% as good but 6 other looks as well. Sort of testing the value of the run n gun by a different metric. I only have one Magbounce, they're actually pretty pricey, $99 for another one over here. I did think about running and gunning with two speedlights and magbounces, but really once you add the handle (which extends the weight further way from the arm/wrist) things start to get 'heavy'. I workout and keep pretty fit, I don't like the idea of trying to sustain running and gunning sessions with more weight than I have come up with. Really I am hoping a diffuser gel before the magbounce will result in a similar output as the umbrella, as at this point the assembling and packing away of the umbrella aspect of the rig is a tad annoying. Ideally I want some kind of belt hoop where I can just dock the flash onto when not needed. I didn't actually have any miss shots in my session with the Octa. I didn't have any miss shots for any of the other shots either. I mean I did take more shots (hence if you check the flickr file numbers there are gaps) but they were just repeat shots in case I missed focus or double checking that a second and third shot resulted in a similar look (which they did). It was kinda simple because I knew already I was fighting sun and in HSS territory so I simply just put the flashes into manual mode at 1/1 (my rationale was why bother with any other power setting, I'm gonna need as much as I can get). Then it's really a case of adjusting the distance of the stand at that power to see the difference. So still producing a nice level of illumination but I would want to amp it up a bit more (but didn't have time, it was getting dark and my dinner getting cold ) I was just testing really to see if I could get a nice exposure in the sky (which I did) and still in P-TTL mode through the diffuser and grid with two flashes in a P-TTL fashion get something usable, which I did, and I had plenty of EV compensation to play with from here. But really, I think 1/1 makes more sense, or 1/2 and then just play with distance a little more than mess with P-TTL or continue tinkering with power. Easier to back off if too much (when hand holding) and crop shot in post vs mess with a dial. Of course with a stand it can be a little trickier, I had some wind so I tent pegged my stand down (and I'm on uneven ground), so adjusting power would make more sense in that situation. For sure I am not finished testing and posting results. Where I think the octabox helps is when I want to shoot further back and handholding a flash can't happen, and firing from afar = too little reach. The Octa with two speedlights seems to overcome that. No diffusion intended for this rig (perhaps you can attach a diffuser umbrella pointing the other direction, but the way the umbrella fans out makes me think the light would be spread around more (albeit weaker). Point is, if you're already going on in the field with a light stand or tripod then an umbrella is not a huge issue to carry as well. Stay tuned for more test shots, not sure about today tho, the weather is a bit damp and miserable. Just watched this now. I like the ingenuity and thinking behind the shot, not sure I actually like the shot itself however. He looks overly orange like the CTO is too much or something, and the fake blue water... hmm... I dunno. There's this weird water backdrop, but I'm confused, is he in the water or not... he looks kinda dry lol. I mean... he's in swimmers... I'm already drawing the conclusion he's a famous swimmer lol. I find it hard they couldn't have done a shoot when the pool closed or some other pool? I mean... he's kinda big deal guy with a big name photographer and no strings could be pulled? I just think the shot is a bit fake and cliché (but I admire the effort and prep work). Thought you would like Greg's thinking. The cool thing about just using 1:1 is that since ambient doesn't matter for flash once you know your set up. The distance will be intuitive. Want a 3rd stop more then move in 40cm. You basically know how far to place things. At f1.8 maybe 2 strides away with the octa. At f2.4 a long stride etc. Your bag of tools and tricks keeps growing and thanks for sharing so I can put them in my bag too.